If you are the type of person who likes to rent a cabin and experience nature at its finest, you will love staying at these cabins in Texas! Listed below you will find cabins in the woods, cabins on Lake Buchanan, cabins on Lake LBJ, cabins on Canyon Lake, cabins in Horseshoe Bay, cabins on the Sabinal River, fishing cabins, cabins for enjoying nature, and cabins for enjoying a little peace and quiet. You will find newly built log cabins and cabins that have been around for a while. 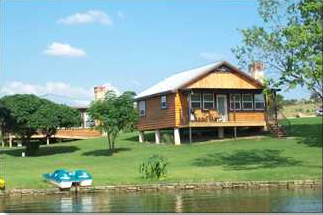 Take a look at our Texas cabins and enjoy a memorable weekend. Click on the Texas Hill Country Cabin Rental links below to go to their web pages. Cabin rentals, RV park and camping on the beautiful North San Gabriel River in Liberty Hill, Texas, 42 miles north of Austin. Swim, fish and tube in the river at this relaxing, family campground. Rent by the day, week or longer. Winter Texans are welcome. Choose from a variety of lodging choices at this unique sanctuary and retreat center. Great views of the lake. Massages, spa, and healthy food. Lake LBJ Yacht Club & Marina has it all! A quiet, peaceful cove and marina are all conveniently located within easy walking distance of 3 newly constructed luxury waterfront cottages. Free day docks with cabin rentals, right in front of the cabins for your boat.